-Seven Days in May (1964), written by Rod Serling; directed by John Frankenheimer. 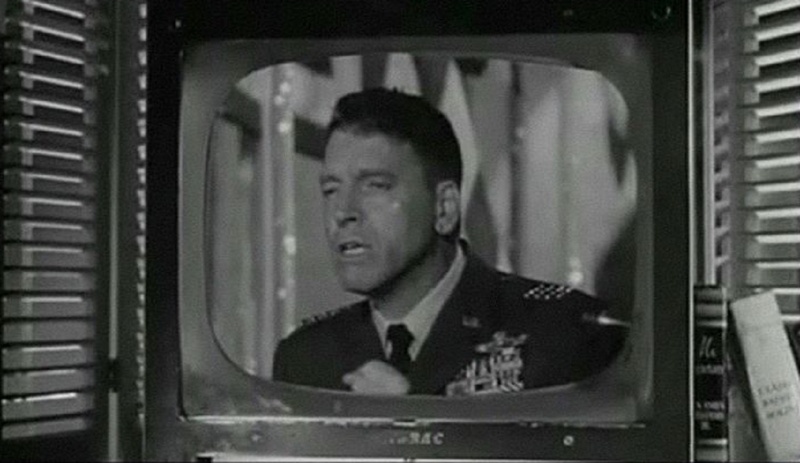 Seven Days in May, a film, penned by Twilight Zone (1959-1961) creator Rod Serling is based on a 1962 best-selling novel that concerns an attempted military coup of the U.S. government by an extreme right-wing, four star general. Like the tale depicted in The Manchurian Candidate, Seven Days in May is actually an unusual -- and often uncomfortable -- fusion of historical inspiration, and speculation that, given the vantage point of time, reads like prophecy. 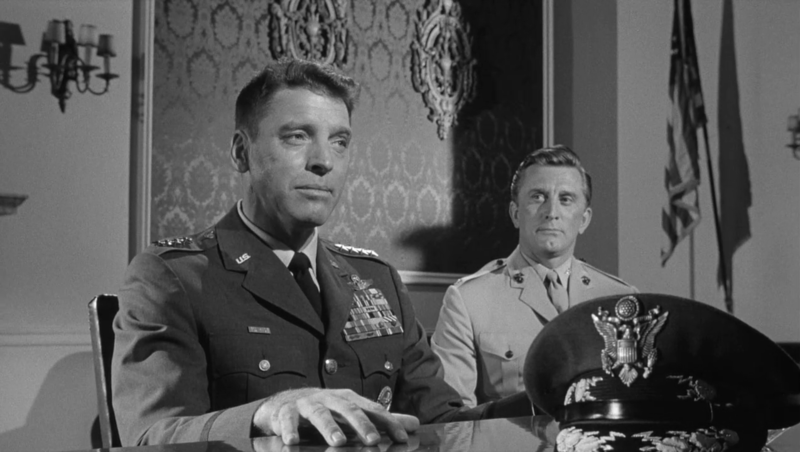 Specifically, Seven Days in May looks to historical figures and events for the nature and details of its villain, the treasonous General Scott (Burt Lancaster). But simultaneously, the 1964 film forecasts the future (or rather, the now…) in terms of right-wing outrage over any U.S. President or agenda not to its ideological preference. As you may have noticed if you’ve been conscious at all for the last eight years, it’s not just that the President’s agenda is wrong to these folks, it is that it is illegitimate and dangerous, and that the Commander-in-chief is actually traitor (or “other”) for possessing non-right wing values and beliefs. We have seen this very dynamic recur in at least three presidencies in modern times, and Seven Days in May -- in a brilliantly-worded finale -- exposes such narcissistic “patriotism” for what it really often is: sedition and treason. You simply can’t lay claim to being a patriotic American citizen if your sole mission in life is to destroy the legally elected U.S. President. Seven Days in May gives us two military men, both right-wingers, and allows us to compare them, side-by-side (much as The Manchurian Candidate provided us two right wing senators -- Harding and Iselin -- and afforded audiences the same type of comparison). 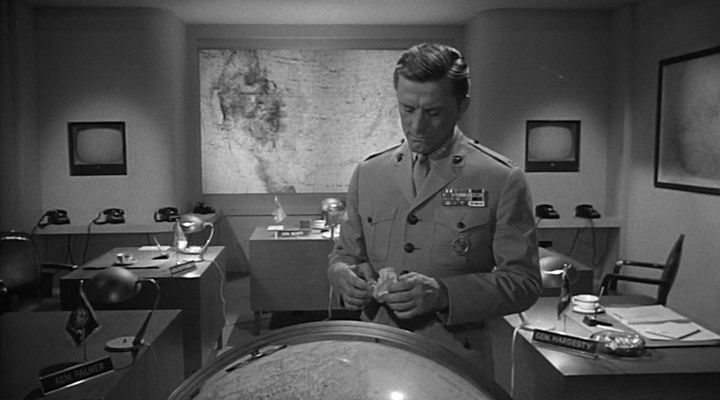 One right-wing soldier in Seven Days in May, played by Kirk Douglas, understands his duty, and obligation under the law, to serve the Commander-in-Chief, even though he disagrees with the president’s politics. Douglas’s Casey is able to put his personal belief system aside and trust in the people who sent the President to office. And then there is another right-wing soldier, the aforementioned Scott (Lancaster), who plots a revolution to substitute his own judgment for that of the lawfully elected U.S. President. Duty is not what calls Scott. Evangelical certainty, and moral self-righteousness are his only guideposts. Seven Days in May is a battle between these two men and their competing visions. One man serves his country, and realizes that to be President is to see things in a different way than a general, or soldier might. The other man serves only his ideology (and thus his vanity). In serving this idol, he steps over the will expressed by the American people. 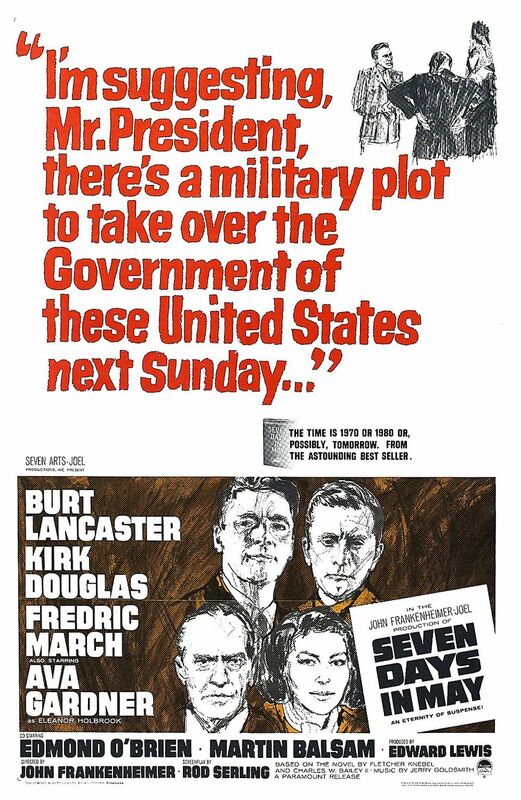 Seven Days in May is disturbing -- and tautly edited -- as the exquisite screenplay by Serling fleshes out the details of the coup attempt, and the President’s last-ditch attempt to hold onto the sacred responsibility that “We the People” entrusted him with. 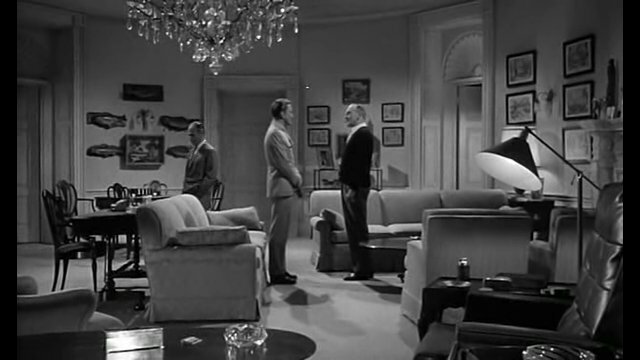 Like The Manchurian Candidate, this film may feel dated to some today, in part because the Halls of Power featured in Seven Days in Men are populated exclusively by white men, and in part because the depiction of Eleanor Holbrooke (Ava Gardner) is a bit patronizing. She is treated, even by Casey, as a child; one who can’t select for herself how she should live, or who she should be. But again -- as I always like to point out -- films are made in a historical context. It’s true that Seven Days in May has seen time pass it by in some ways. But like The Manchurian Candidate, it seems to resonate more fully today than it has in some recent years. In some fashion, it has been passed by modern contexts, and in other ways Seven Days in May is again frighteningly timely. Marine Colonel Jiggs Casey (Kirk Douglas), through happenstance and coincidence, discovers that his superior, the head of the Joint Chiefs of Staff, General Scott (Lancaster) is moving men and equipment in preparation for a coup in just a matter of days. In just a week, Scott and those he commands will seize all television and radio communication in the United States, using a secretly-funded and secretly-manned unit, ECOMCON (Emergency Communications Control) to usurp authority from the historically unpopular President, Jordan Lyman (Fredric March). Scott’s reason for the coup is simple. He disagrees with a disarmament treaty between the Soviet Union and the United States that the President supports and wishes to see ratified. Many Americans feel just as he does, and many of them protest outside the White House. Casey reports everything he knows about the coup attempt to the President, and Lyman’s chief of staff, Paul Girard (Martin Balsam). Girard rejects the tale as paranoid fantasy, but the President realizes he can’t afford to be caught flat-footed, and organizes a brigade of trusted aides to help him determine where he stands. As everyone is quick to realize, General Scott controls the military, and therefore possesses force. The President’s great power, by contrast, is the moral authority of his office, and the Constitution. Girard is killed in a suspicious plane crash while soliciting the aid of a Navy officer (John Houseman) who refused to be part of the coup. 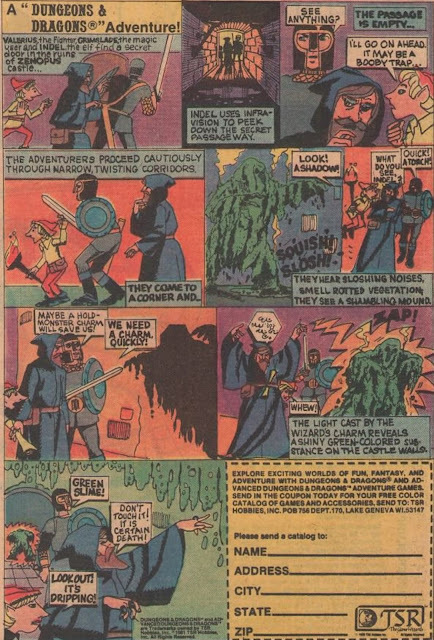 Meanwhile, the President’s friend, Senator Raymond Clark of Georgia (Edmond O’Brien) is held in custody by Scott’s men when he attempts to find the secret ECOMCON base. Casey is ordered, against his will, to hunt down incriminating love letters from Scott to his former lover, Eleanor (Ava Gardner), so that the President, if necessary, can “slime” his enemy with them. The President absolutely resists this option -- realizing it works against his moral authority -- and instead demands, in a face-to-face meeting, Scott’s resignation. Seven Days in May opens with a pan down across the United States Constitution. The writing on the document is large enough, and clear enough that we can read it. As the camera pans down this founding document, the numerals 1 to 7 are scrawled hastily and awkwardly over it, in black writing. This writing suggests that in just seven days, the Constitution can be desecrated, if Scott’s plan is carried out. The writing over the founding document is thus akin to graffiti, despoiling the image of the Constitution. And this optical “superimposition” of graffiti, of writing, over our Constitution also serves as a metaphor for Scott’s actions. By planning to take power from the President, and from the people who elected him, he is similarly spoiling or betraying America. 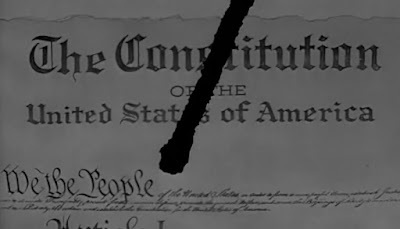 We see the Constitution literally soiled. And we see Scott’s plan to trample it. After this dynamic and effective opening, Seven Days in May cuts to a protest outside the White House as it becomes violent. On one side of the divide are the folks who see the disarmament treaty as a cowardly, treacherous act. On the other are those who agree with Lyman, and view the treaty as a way to help secure peace in our (nuclear) age. Frankenheimer’s camera takes us right into the scuffle with a shaky cam, quick cuts, and very informal camera work. This approach makes the protest surprisingly visceral, and also has the effect of making us feel under siege; like we are there, experiencing the protest and the blows ourselves. This technique is perfect because, of course, we are there. We all grapple with issues like this, on a daily basis. We all stand to win or lose, depending on how things turn out, depending on what our leaders decide. These two scenes, in tandem, create quite an ominous or tense mood right out of the gate. First, we see our most revered founding document desecrated, and then we see civil debate break down into irreconcilable violence. Together, these two moments light the match, the fuse that burns throughout Seven Days in May right up until the film’s cathartic and uplifting final speech by Lyman, a true statesman. In terms of its approach to history, Seven Days in May has clearly selected some historical inspirations for Scott, the self-aggrandizing “patriot” who is convinced, primarily, of his own greatness/correctness. 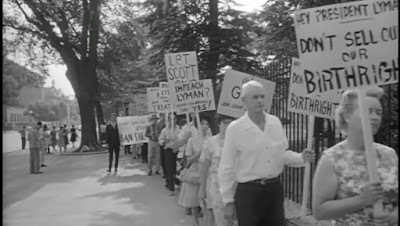 Some critics (and indeed, Frankenheimer himself), view Scott as a Senator McCarthy figure. McCarthy, as I wrote in another review, led a witch-hunt against “Communist infiltrators” in the U.S. Government to make, actually, a name for himself. 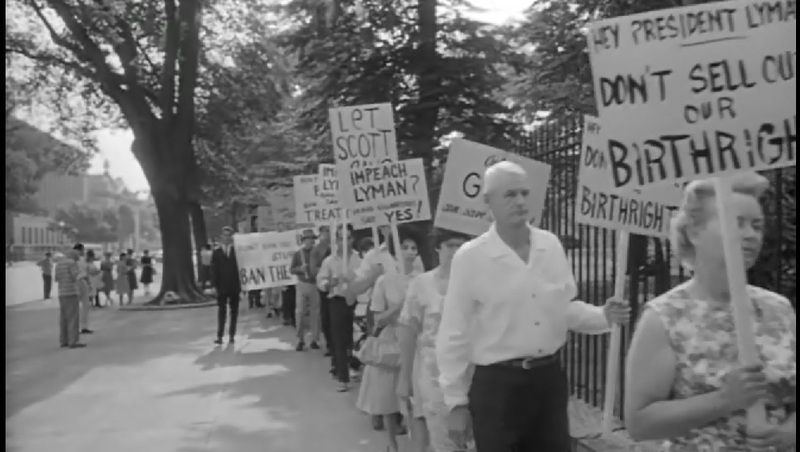 Other see Scott as a corollary for General Edwin Walker, a man whom President Eisenhower chastised for putting his own personal politics above his duty. Eisenhower asked for, and received, Walker’s resignation. Today, men of this stripe are still with us, putting their personal religious beliefs and views on ideology ahead of their job as military men or advisors to the government. So, Seven Days in May has not created Scott out of whole cloth in some attempt to discredit people on the right side of the political spectrum. Instead, a straight line can be drawn from men like McCarthy, and Walker to Scott…and then people in the present time. And again, we have the example of Casey. He is from the same political party and belief system as Scott, but he is not a demagogue or an ideologue. He is a patriot who sees the system as wise, and protects it from desecration. What Seven Days in May also gets right is the long, historical -- and let’s face it -- disgraceful attempt to dismiss and diminish peace efforts (and treaties, specifically) as insidious weak-kneed methods by which Presidents plan to destroy America. Think this is a belief that only occurs in fiction? 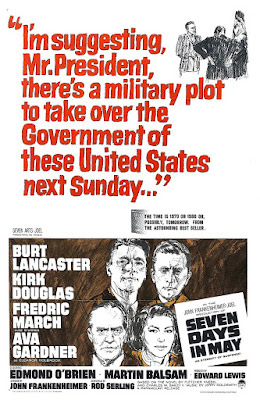 Seven Days in May cannily includes a Senator (Whit Bissell) in the conspiracy “loop” with Scott, and goes just one step further: making the mutiny and treason manifest as a military take-over. Most deftly, however, Seven Days in May gets right the notion we see so often in our national discourse; that people are loudly patriotic only so long as their party and beliefs are in power. When they are not in power, what do they do? How do they act? What do they say? Posted at the top of the review is the speech by President Lyman in Seven Days in May, which addresses this terrible quality, the diminishing of America to score political points…even when the whole world is listening. President Lyman rightly reports exactly what this kind of talk really is. It is “slander,” he declares. America is great. Great enough to be both strong and patient, and to seek ways out of wars, rather than finding excuses for fighting them. That speech calls out men who purport to be patriots but actually root against America when their team isn’t in power. Lyman has another great moment in the film. He is baffled -- as often I am -- by the hatred of these so-called patriots for the very government they claim to revere. And one we should all still be asking, even fifty years since Seven Days in May’s premiere.